So, I have a small kitchen. Or… I have too much stuff in the kitchen. It’s a little of both. No matter what’s to blame, I’ve been struggling with the size, especially the amount of counter space, and the stuff, especially the stuff clogging up my counter space, for a long while. We’ve lived in our house for a little over a year now, and though my inner Joanna Gaines is all over this renovation – recessed can lighting, open floor plan, shiplap accent walls, new flooring, ceilings, windows, charming antique embellishments and so on- it’s not in the cards. 1st off this is a rental home, so you know, it’s not ours to makeover. It is ours to live in and care for, keep clean and make our own- within reason. 2nd, we don’t have a house makeover budget at this time. That’s fine because my style is super bohemian and I have art and mismatched things all over the place, so I’m not trying to go full Pottery Barn anyway (side note- I also love Pottery Barn, that was not a dis). So, what brought this kitchen conundrum to a head? The dishwasher broke. I’ve lived with and without dishwashers and I can say unabashedly that I prefer to live with a dishwasher. Charming pile of dishes to deal with while trying to bake and stuff… notice the broken dishwasher staring at me. When it broke I realized just how much time and energy it takes to wash dishes for four people who eat three meals a day at home. I was spending lots more time doing that than I wanted to, plus I felt stuck in the kitchen… PLUS, I was shoving things out if the way and moving our microwave, toaster oven and bowls of fruit and vegetables on and off of the counter to have room for drying dishes. Irritating. just no space, and the crazy straws I regretted buying, because it’s just more stuff to make a mess with. So while the new dishwasher was on order, I decided to give my kitchen and mini makeover! We happened to have a little credit at a local consignment shop because we got rid of some furniture there when we first moved here, so I went there to see if they’d possibly have anything I could use to ease the counter problem. I did some preliminary measuring, and found that I most certainly did not have room for an island (maybe in my next house?) or anything taller than three feet or wider than about 2 feet. I picked a little unitized space under spice cabinet. Here’s my little cart after Daph and I washed it and I figured out that the microwave fits on the bottom shelf! What I found at the consignment shop has changed my life for the better. 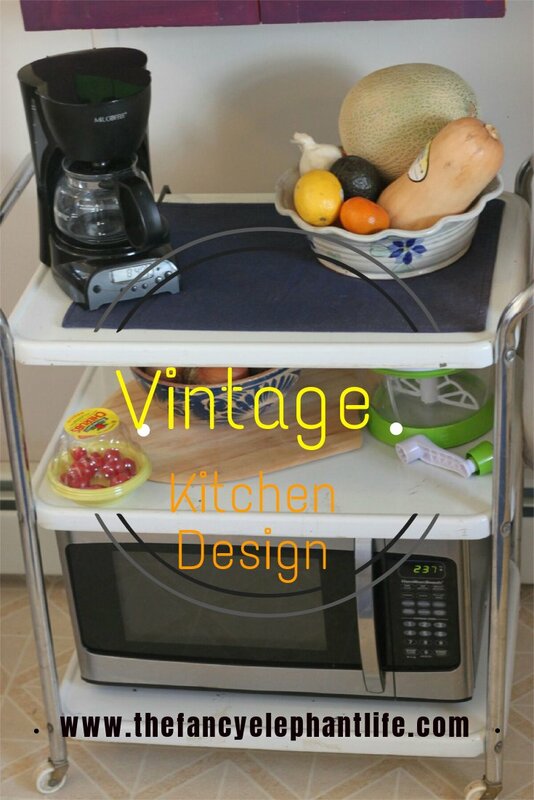 Enter this 50’s or 60’s (I’m guessing) era kitchen cart. It needed a scrub down- I didn’t mind that. I cleaned it up and parked it perfectly in its under the spice cabinet spot. On its 3 little shelves it neatly houses fruit and vegetable bowls, the microwave, my coffee maker and a couple of other kitchen necessities- my slicer dice do-it-all for example. See? Do you see how the counter space appears to have abundant space for drying dishes, cooking, and plain old elbow room now?! And see, how clean and ready for cooking it is? The sink- empty. Guess who is washing the dishes for me now? That’s right, the new dishwasher… Baby, I’m livin’ the good life. This little unassuming cart, it’s cost being covered by our credit, rolled into my kitchen and refreshed my take on life. I may paint it this summer, or maybe not… it’s used vintage look is growing on me. I never would have suspected that adding furniture to a space I thought was already over packed would actually make it seem bigger and far more user friendly. This lesson was brought to me by the little kitchen cart that could. I love reading your posts, Hope.